The north west and west coast of Tassie are rugged areas of the state that have a mixture of mining, forestry, hydro electric generation and tourism. Don't me fooled by the short distances, as the roads twist and turn every chance they get! This is why the west coast is home to the legendary Wildside MTB stage race. 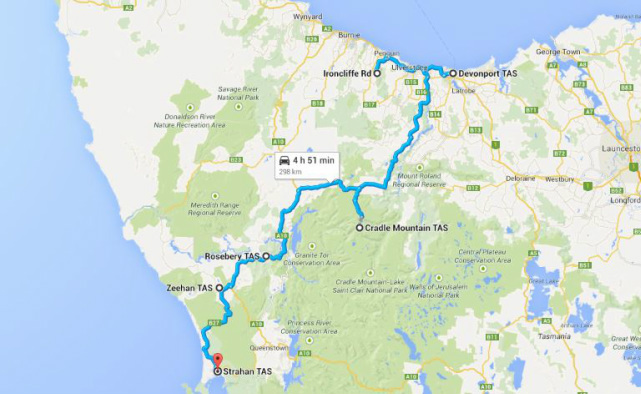 This region has has the iconic wilderness areas of Cradle Mountain and Strahan and its Gordon and Franklin Rivers. It is also home to the Wilderness West Coat Railway. You basically need to take everything with you, although most towns have supermarkets, fuel and takeaways. No bikeshops except in Burnie, Ulverstone & Devonport. Non - Riders? There are heaps of things to do if you are bringing non-riders with you. The north west & west has a wide range of historical points of interest, national parks, seaside towns and day trips.